• Precise measurements are key. • Use a steel tape measure, measuring to the nearest 1/4" in width and to the nearest 1" in length. • Measure each window and doorway individually. 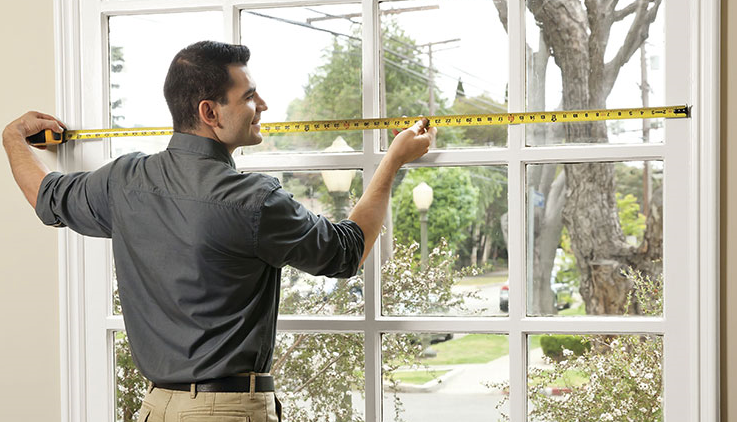 • Measure the width of your window, taking into account whether you’d like a trim-mounted or wall-mounted rod. Then measure your rod/track length from one side of the rod to the other (excluding the finals/cap). • If you choose to expose your entire window: Add 3-15" to the actual width of the window to allow enough space when the curtains are completely open in order to “clear” the window. If fitting a new track or pole, this should extend 3-15 inches either side of the window frame opening to allow the curtains to be stacked back off the window and to cover the gap for privacy and insulation purpose. This will help make the area look larger, and will also allow as much natural light as possible when the drapery is open. • Drapery rods are typically installed 4" above the window frame. • Your custom drapery will be made to the width you specify. • Pinch pleated and goblet header style are constructed with fabric 2.0 times the width of the rod or track length. • Consider the extra wall space needed for decorative finials. Add the extra inches needed for decorative finials. • The total from the 3 measurements above is the amount of horizontal space needed for your drapery rod. • Drapery rings include hook rings and clip rings. They need to be purchased separately. Rod ring works for pinch pleated, goblet and flat hook header style. Clip rings works for rod pocket and flat hook header style. • Pinch pleated, goblet and flat hook header style drapery that is hung from rings requires the drapery rods to be installed at a height greater than the length of the drapery. Purchase rod rings here. 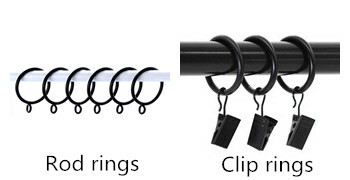 Purchase clip rings here. • Drapery rings are recommended for ease of opening and closing drapery panels. • Note that drapery rings add a few extra inches to your rod placement. rings, measure the distance from bottom of rod to top of drapery fabric; add this measure- ment to the drapery length. • To determine proper rod height if not using drapery rings: Simply measure the distance from bottom of rod to floor, and install the rod at that height. 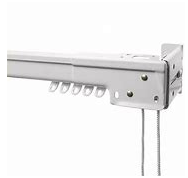 • For low light-filtration, mount the rod 6" above the trim and allow the rod width to extend at least 3" beyond either side of the window frame. • To add visual height to a room, mount the rod closer to the ceiling. When hanging Rod Pocket drapery, there is some rod “take-up” when the material is gathered onto the pole. Typically, you will need to install smaller rods 1" lower than the finished length, while rods with a diameter of 2" or more will need to be installed approximately 2" lower. Measure rod or track full length not simply the window itself. If tracks have a centre overlap, measure it separately and add it to your end-to-end measurement. The measurement you take here is your total pole or track width that your curtains will be covering. To avoid draperies looking like a stretched sheet, you need to consider to add fullness for additional width to cover. 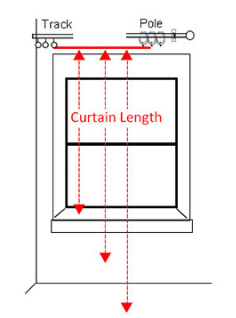 Curtains and draperies should be 1x-2x times the final measured width. Less fullness will produce a more tailored look, while more fullness will create a richer, more opulent appearance. You determine how many panels you need to achieve the desired fullness. Fullness ratio vary by header style. For example, grommet header style. Multiply the width (B) by 2 for 2 times fullness or 1.5 for lesser fullness. Example: If your B is 80" wide, then 80" x 2 =160". So single panel width should be 80" （160/2=80“). Measure the desired length of your drapery. Keep in mind the hardware type you plan to use and where it will be mounted. The finished length you supply us with is the exact measurement to which the drapery will be made. Measuring finished length method vary by header style. 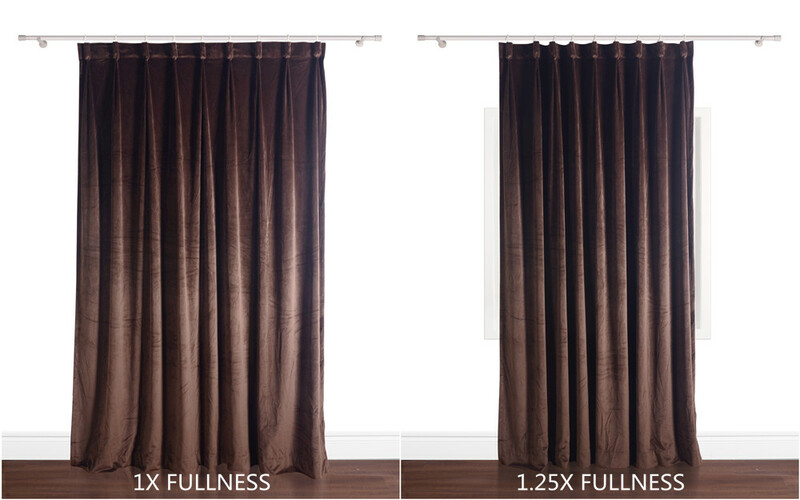 We recommend fullness ratio 1.5x-2x to create the waves and folds when close the curtains. Measure from the top of rod to where you want the bottom of the drapery to be (1/2" above the floor, or approximately 6" to 8" below the window sill ). This is your finished top of pole to hem drop. Approximately 1" of curtain will be added above the eyelet to stand above the pole. This does not affect the hanging length of your curtains, but creates a finished look - you don't need to account for this additional 1" in your measurements. We recommend fullness ratio 1x-2x. More fullness means more width to allow the curtain gather for causal style. If you need the rod pocket header style more simple, fullness 1x without gathering at top could be an option. 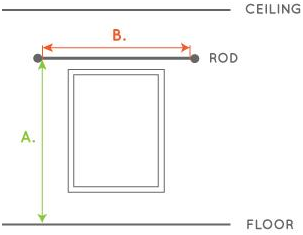 For example, rod full length is 96 inches, the single panel width need 48-96 inches if you hang 2 panels. You may decide fullness as per your need. Measure from the top of rod to where you want the bottom of the drapery to be (1/2" above the floor, or approximately 6" to 8" below the window sill ). This is your finished top of pole to hem drop. Option 1 is normal defaulted style, and option 2 has 1" flange at top for decorative purpose. 1" of curtain will be added to stand above the pole. This does not affect the hanging length of your curtains, but creates a finished look - you don't need to account for this additional 1" in your measurements. If you don't need the 1" header, please let us know. Product is with 1" header in default. We recommend fullness ratio 1.25-2x. 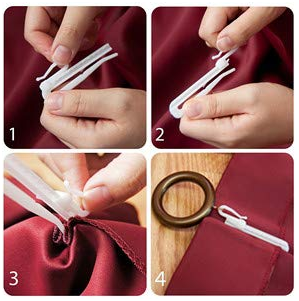 If the rod pass through the tab on the back, more width is needed to create the folds. For example, rod full length is 80 inches, the single panel width need 50-70 inches if you need 2 panels to hang. Measure from the top of rod to where you want the bottom of the drapery to be. 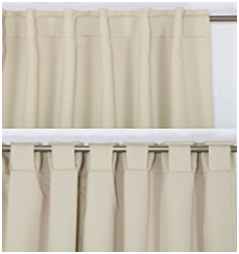 We think most of time curtains with tab top heading style don't need too much stacks and gathering at top, so we recommend fullness ratio 1-1.5x. 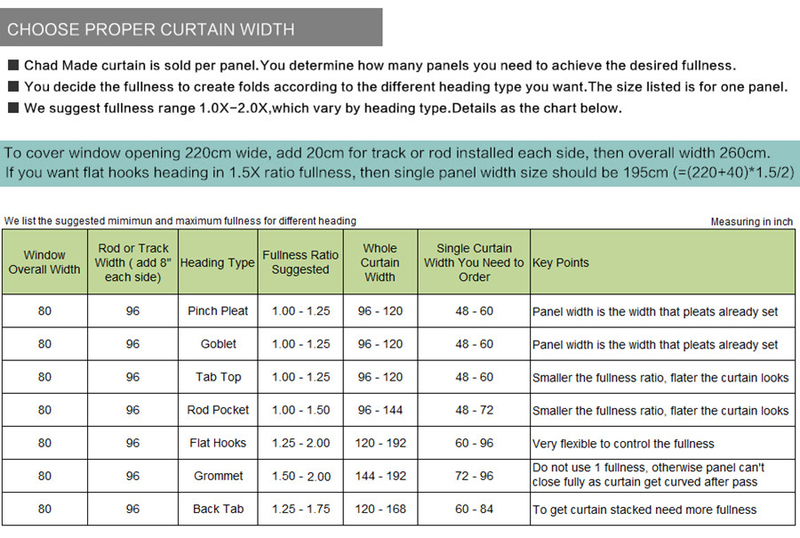 For example, rod full length is 80 inches, the single panel width need 40-60 inches if you need 2 panels to hang. Measure from the top of rod to where you want the bottom of the drapery to be (1/2" above the floor, or approximately 6" to 8" below the window sill ). This is your finished top of pole to hem drop. Our drapery length reflects the full length of fabric, from the top edge to the bottom hem. It fit for track traverse rod or rod with clip rings. 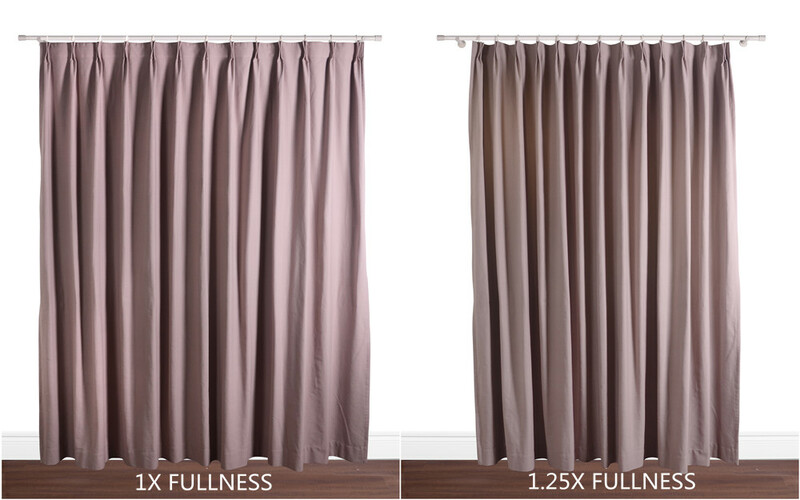 When you want the drapery looks flat ( like cubicle, room divider curtain etc), less fullness like 1.0x could be considered. If you want more folds, you may choose fullness 2.0x. We suggest fullness 1.0-2.0x. For example, rod or track full length is 80 inches, the single panel width need 40-80 inches if you need 2 panels to hang. Measure from bottom of rings to top of floor or top of window sill, depending on desired window coverage. Subtract 1/2" to get the panel length you need. Pin hook has a ratchet system to make it adjustable up and down within 3". Panel width is the finished width that goblet hooks are set. We use 1.5X fabric width in default to create folds and wave. The width measurement of each panel based on the top width instead of the total fabric. When the size list say width 80 inches, we use 120 inches width to make. Our quote already consider this cost. We suggest fullness 1.0-1.5x. 1.0x is normal consider, and 1.5x is for overlap and possible some fabrics are not easy to be stretched in neat and straight shape at top when hanging. No more width fullness is needed. For example, rod or track full length is 80 inches, the single panel width need 60 inches ( 80 x 1.5 = 120, 120/2) if you need 2 panels to hang. We use a fully adjustable sliding strong plastic cylindrical curtain hook for ease of use. It fit for track traverse rod or rod with rings. Panel width is the width that pleats already are set. We use 1.8X fabric width in default to create pleats and folds. The width measurement of each panel based on the top pinch pleat width instead of the total fabric. When the size list say width 80 inches, we use 144 inches width to make. Our quote already consider this cost. Pinch Pleats can often require more widths of fabric for a given track/pole width, it can be quite a bit more expensive than other headings. The fullness is conception that the pleats were already set. We suggest fullness 1.0-1.25x. 1.0x is normal consider, and 1.25x is for overlap and possible some fabrics are not easy to be stretched in neat and straight shape at top when hanging. No more width fullness is needed. For example, rod or track full length is 80 inches, the single panel width need 40-50 inches ( 80 x 1.25 = 100, 100/2) if you need 2 panels to hang. Pinch pleats are more gathered than other headings and have permanent sewn-in pleats for a more luxurious, tailored look. We use a fully adjustable sliding plastic curtain hook for ease of use. Panel width is the width that pleats and goblets are already set. 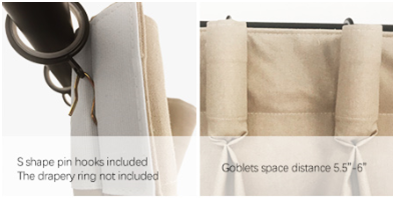 We use 2X fabric width in default to create goblet shape and folds. The width measurement of each panel based on the top goblet width instead of the total fabric. When the size list say width 80 inches, we use 160 inches width to make it. Our quote already consider this cost. The fullness is conception that the pleats were already set. We suggest fullness 1.0-1.25x. 1.0x is normal consider, and 1.25x is for overlap and possible some fabrics are not easy to be stretched in neat and straight shape at top when hanging. For example, rod or track full length is 80 inches, the single panel width need 40-50 inches ( 80 x 1.25 = 100, 100/2) if you need 2 panels to hang.